Tart recipes are often sweet, generally fruity or filled with custard, or savory, using meat or cheese. Flans and quiches are specialized types of tarts. 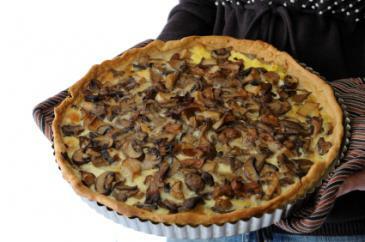 Tart sizes can also vary from full entrée quantities to individual, personalized portions to petite dessert tartlets. Due to their similarity in form and function, many people confuse tarts and pies. 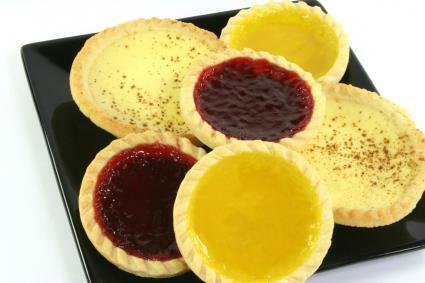 Tarts, however, typically do not have a top crust (as do most pies, with the exception of cream pies) and are usually presented in shallower pans with straight, fluted sides. In a large bowl, use an electric mixer to cream the butter with the sugar and salt. Beat in the egg, and mix the dough until it's smooth. Add the flour in two or three additions until it's incorporated. The dough should be moist but not too sticky. Press it into a disk, swath it in plastic wrap, and chill it in the refrigerator for 45 minutes or longer. Near the end of the chilling time, preheat your oven to 350 degrees Fahrenheit. Remove the dough from the oven. Flour your work surface and a rolling pin. Roll the dough out until it's evenly thin and large enough to line a 9" or 10" round tart pan. Place the dough in the pan and press it gently against the bottom and sides. Cut off any excess dough, patching up any holes with the dough scraps. Poke the dough in several places with a fork. Line the dough shell with a sheet of parchment paper or aluminum foil and fill it with pie weights, rice, or beans. Blind bake the tart shell for 10 minutes, then remove the pie weights and paper or foil and bake for an additional 7 to 8 minutes. The crust should be just starting to brown. Let the dough cool while you make the filling. In a saucepan, heat the cream and milk to a simmer on the stovetop. Turn off the heat and stir in the chopped chocolate until the mixture is completely smooth. Let it cool for 5 to 10 minutes and then whisk in the egg. 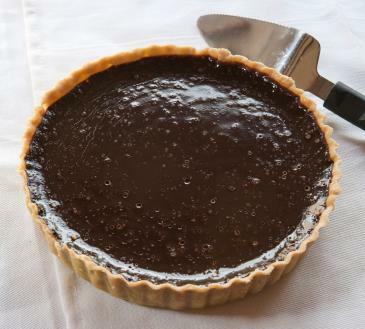 Pour the chocolate filling into the tart shell. Bake the tart for 15 to 20 minutes or until the filling is set around the edges and the center is still a little jiggly. Allow the tart to cool on a wire rack before serving (you can also chill it in the fridge). To serve, slice into wedges and sift cocoa powder on each wedge. Garnish with sea salt if desired. Preheat the oven to 350 degrees Fahrenheit. Dust your work surface with flour and roll out the puff pastry. You can lay the large sheet out on a baking pan or press it into a tart pan. Blind bake the puff pastry for about 10 minutes or until it is just beginning to brown. In a large frying pan or saucepan, melt the butter on the stove over medium heat. Add the garlic and onion to the pan. Reduce the heat slightly, and sauté the onion and garlic until it is caramelized. Add the mushroom slices to the pan and sauté until they are soft and fragrant. Remove the pan from the heat and stir in the Parmesan and parsley. Season with salt and pepper to taste. Spoon the filling into the center of the tart. Transfer the tart to the oven and bake for about 20 minutes or until the edges are puffed and golden. Tarts may be simple or complex, though several tips can help make even the most difficult dish more accessible to inexperienced chefs. If making the dough from scratch, work quickly to keep the butter or shortening chilled. Raw dough can be chilled to solidify the butter and make it easier to hold its shape. Roll dough onto non-stick parchment paper or a floured surface for easier shaping. Consider using graham or frozen crusts in place of homemade dough for faster, easier recipes. Garnish fruit tarts with decorative slices or whole fruits, arranged in symmetrical patterns for creative and elegant flair; use sprigs of herbs for savory tarts. Depending on their size and composition, tart recipes can make delicious breakfast dishes, casual meals, elegant repasts, or gorgeous desserts. Suitable for any number of social occasions, tarts are a sweet accompaniment to any chef's repertoire.